You are at:Home»Arts & Entertainment»Cinema & TV»Real Life Versus Fictional Badass Women! By the way, after winning the Iditarod, Libby decided to live the Native Alaskan (“Eskimo” in the Anglicized version) lifestyle for the next 6 years! Questions for Students (and others): Who do you believe is the roughest, toughest, most “badass” real life woman ever? How about fictional? A British folk hero, Boudica (various spellings) was queen of the Iceni tribe of the British Celtic people being oppressed by the Romans in 60 and/or 61 AD. Boudica was the widow of the King, and when the King died and left his kingdom jointly to the Roman Emperor and the King’s own daughters, Boudica was having none of that! Ignoring her husband’s will, Boudica led an armed insurrection against the Romans and earned a reputation as a fierce and determined warrior. Boudica led a revolt that left as many as 80,000 Romans and their British allies dead and won major battles, but in the end the weight of the Roman Empire was too much and defeat for the Iceni was inevitable. When faced with surrender, Boudica instead chose death by poisoning at her own hand. The revolt was, in British parlance, “A close run thing,” as Roman Emperor Nero nearly decided to abandon Britain because of the cost of putting down the revolt. Centuries later the tales of Boudica became widespread, and by the Victorian Era she had become an icon of Britain. Evolution of Lara Croft, over the years. Originally a video game character from the game, Tomb Raider, the Lara Croft character is an Englishwoman of exceptional beauty, athleticism, agility, skilled in fighting and many physical arts as well as highly intelligent and courageous. The character was spun off for animated shorts and was played by Angelina Jolie in 2 feature films (2001, 2003) and in 2018 a new Tomb Raider film starred Alicia (“The Delicia”) Vikander. Unlike Wonder Woman and Captain Marvel, Lara Croft does not have super powers, she just seems as though she does! Lara Croft came to “life” with the introduction of Tomb Raider in 1993, by Core Design. 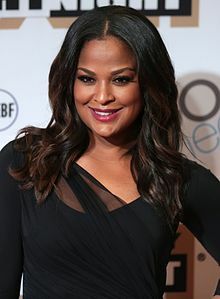 Laila Ali in 2017. Photograph by Gage Skidmore. The daughter of the mega-famous boxing legend, Muhammad Ali, Laila herself became a professional boxer and what a boxer! Like her father, she became a professional boxing champion, but unlike her father, Laila was never defeated in the ring! Her record of 24 wins in 24 fights, along with 21 of those fights ending in Laila knocking out her opponent is unmatched in women’s boxing history and matched only by Rocky Marciano among men. Known as “She Bee Stingin’,” Ali wisely quit boxing in 2007 at the age of 29 and avoided the ravages of staying in the ring too long. At 5 feet 10 inches tall, she boxed at 166 to 175 pounds, starting at the age of 18. A go-getter out of the ring as well as between the ropes, Ali was already a manicurist at age 16 and is a graduate of Santa Monica College with a degree in business. She has also done some acting and making commercial ads. She has been married twice, has 2 children, and was raised a Muslim, though she no longer practices a religious faith. Wonder Woman in Justice #5 (June 2006). Art by Doug Braithwaite and Alex Ross. From the comic books to the television to the movie screen, this character is a dynamo of crime fighting, evil plot busting energy! Formally known as Princess Diana of Themyscira, Daughter of Hippolyta, Wonder Woman comes from a race of Amazon women, coming to life from being sculpted from clay by her mother (in the original story from 1941). Wonder Woman exists in the DC Fictional Universe and is a member of the Justice League. The television version was played by actress Lynda Carter (1975-1979) to such perfection that her portrayal is akin to that of Sean Connery as James Bond or Christopher Reeve as Superman. Carter was the 1972 Miss World America beauty queen, but brought convincing toughness to the role balanced against her terrific beauty. Former Miss Israel, actress Gal Gadot picked up the shield for the big screen in 2016, then starred as the title character in 2017’s Wonder Woman. Incredibly, Gadot plays the part of Wonder Woman every bit as well as Carter, a truly amazing accomplishment. Wonder Woman goes by the less bombastic name of “Diana Prince” while slumming around among the mortals, incognito. Real: Mildred Ella “Babe” Didrikson Zaharias. Born in 1911, and dead at the age of 45 in 1956, of colon cancer, Babe crammed one heck of a lot of living into her few years. Her athletic prowess seemingly knew no bounds, as she won 2 Olympic Gold Medals in track and field at the 1932 Olympic Games, took home the winning trophy from 10 major golf tournaments, and found time to excel at baseball and basketball as well! She is considered one of if not the greatest female athlete of all time, and certainly one of the most proficient at a variety of unrelated sports. In fact, though we just said “female athlete,” no male athlete comes to mind that dominated so many sports except Jim Thorpe, putting Babe up there with the greatest athletes in Human History, period. On top of her athletic achievements, Babe was also a completive sewer and accomplished seamstress, played musical instruments, and recorded songs as a singer. She even did some acting. 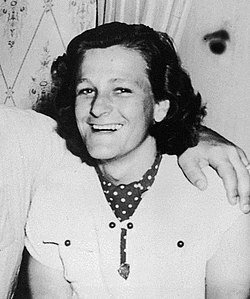 Her birth name was Mildred Ella Didrikson, and she was called “Bebe” by her Norwegian mom, though she claimed the Babe nickname came from her prowess as a baseball hitter in her childhood. (Her parents were immigrants from Norway, and by the way, this author has been to Norway and the country is about the most beautiful place in the world.) Her husband, professional wrestler George Zaharias, lived until 1984. The couple had no children, and sadly were denied permission to adopt when they tried. 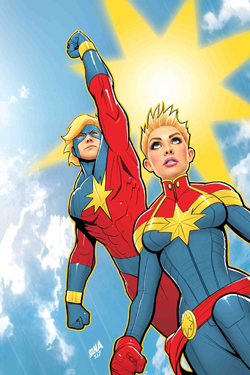 This time the character is unique in that Captain Marvel was created as a male character, though not always been portrayed as a man, and in 2019 the new Marvel movie, Captain Marvel, reinvented the character as a woman, following the lead of the Carol Danvers (Ms. Marvel) character from the comic books (since 1977). In 2012, the Ms. Marvel/Carol Danvers character was elevated to the upper level of super heroes in the Marvel comic universe. Marvel comics first introduced the character in 1967 and used the unusual technique of changing the character between a few different personages, going through several reinventions along the way. The latest version is endowed with super powers, not merely strong, fast and smart, gaining her powers from the explosion of an alien space engine. She then gets recruited by Avengers leader Nick Fury as a potential new member of the Avengers, with a pager so she can be called when really needed! The actress that portrays Captain Marvel/Carol Danvers in the current cinematic version is Brie Larsen, who created some controversy prior to the release of the 2019 Captain Marvel film by seemingly denigrating White men in favor of women and minorities. Despite the controversy, the film is making big bucks at the box office, especially outside the United States. 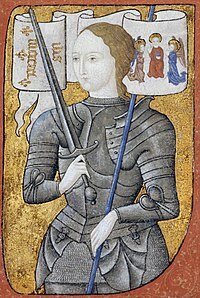 Known in her native French as Jeanne d’Arc, and colloquially as The Maid of Orleans, Joan was a nationalist patriot that as a teenage girl had visions of God talking to her imploring her to lead France to victory over the English during the Hundred Years’ War (Lancastrian phase). Her first big victory was leading the French in the successful lifting of the siege of Orleans (1429), followed by several other French victories. She was captured by French Burgundian allies of the English in 1430, and instead of being treated as an honorable prisoner of war, she was instead put on trial for the crime of heresy. Joan was burned at the stake in 1431, after being convicted of heresy and refusing to recant her claim of being directly inspired by God. In 1456, Pope Callixtus III convened an examination of the events of the trial and execution of Joan, determining that the conviction and execution was wrong and without merit, declaring the teenaged warrior innocent and a martyr. In 1803, Napoleon Bonaparte declared her a national symbol of France (and he knew a thing or 2 about courage and courage in battle) and in 1920, the Catholic Church canonized Joan as a saint. This brave and dedicated young lady has become a symbol of courage and defiance in the cause of righteousness and has spawned innumerable cultural references. 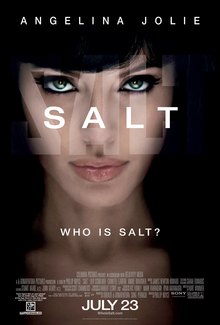 While there have been numerous Hollywood movies featuring a female warrior, intrepid adventurer, spy, assassin, or general badass, one of our favorites is the title character from the 2010 film, Salt. Starring Angelina Jolie as Evelyn Salt, she is suspected of being a Russian double agent. Through a series of adventures Salt proves herself eminently resourceful and fearless, as well as highly trained in the use of weapons and hand to hand fighting. While Salt is revealed to have Soviet origins and training, she also acts to benefit the United States by killing a bunch of Soviet agents and American moles, saving the US. If you are into action/adventure movies such as the Bourne series, James Bond films, No Way Out, or the Lara Croft/Tomb Raider films, this movie is also for you. Ederle, known as Trudy to friends and family, was the daughter of German immigrants to the United States (New York City), born in 1905 and establishing herself a premier swimmer by winning an Olympic Gold Medal and 2 Olympic Bronze Medals in the 1924 Olympic Games. In 1926, she became the first woman to swim across the English Channel, although her first attempt did not go well. In that first attempt, while resting face down, her trainer thought she was drowning and ordered another swimmer to “rescue” her, which resulted in Trudy’s disqualification. That trainer had made comments to the effect that “women may not be capable of swimming the channel” which makes one question his commitment to the attempt. Her second attempt went better, this time with the help of trainer Bill Burgess, the man who had been the first to successfully swim the English Channel in 1911. Trudy’s time across the Channel of 14 hours and 34 minutes remained the fastest Channel swim, male or female, until finally beaten in 1950. She had beaten Burgess’ time by 2 hours! In her career Ederle owned 5 World Records. The Channel swim made Ederle a national heroine and earned her a ticker tape parade, and a spot in the pantheon of inspirations for girls across the world. Diana Nyad was another product of New York City, born in 1949. A renowned open water distance swimmer, some of Nyad’s feats include swimming all the way around Manhattan Island, swimming from the Bahamas to Florida and swimming from Havana, Cuba to Key West, Florida. Not a one trick pony, so to speak, she found time to be ranked #13 in the US in Squash. Several of her long ocean swims set World Records, including her 102 mile swim from the Bahamas to Florida in 1979, after which she intended to retire. In 2013, at the age of 64, Nyad finally succeeded on her 5th attempt to successfully swim from Havana, Cuba to Key West, Florida, a distance of 110 miles through shark infested water. While Nyad did not use a shark cage, she did wear a protective suit to guard against jellyfish stings, a choice she called a “matter of life and death.” Wearing the suit caused detractors to consider her swim “aided” or “assisted,” but most people recognized the feat for the incredible accomplishment it was, something no man had accomplished and at age 64 to boot! The marathon swim took a mind numbing 53 hours. The character, “Xena: Warrior Princess,” first appeared on the television series Hercules: The Legendary Journeys (1995-1999) and earned a spin-off show of her own (1995-2001), as well as a comic book series and a book, video games, and an animated movie. Played by the rugged and beautiful Lucy Lawless on TV, the Xena character became an icon for feminists and even lesbians as a strong woman second to no man. The character is also believed to be the inspiration for other super-tough women in other movies and television shows. Xena underwent a quick transformation from villain to heroine in only her first 3 appearances, and had a female sidekick, Gabrielle, as a sort of understudy and companion. While filming her role as Xena, Lawless suffered many injuries, such as cuts from swords and falls from horses. Xena’s extreme fighting ability may or may not be attributed to possible divine heritage, her father perhaps having been Ares, the God of War, though that fact is only hinted at. Xena has a baby girl that is imbued with the spirt of an angel. The Xena tale is set in ancient Greek times, and later crossing paths with the Roman Empire. By the time this fearless girl was 11 years old, she was hosting a blog regarding women’s rights, a dangerous occupation while living in the Pashtun area of Pakistan, an area under constant threat from the Muslim fundamentalist Taliban. Believing that girls need a school education is a family trait, as her parents bravely conducted classes for girls despite the misguided religious proscription against females being educated, or even being taught to read! For her courage, at the age of 15 while riding on a bus, Taliban terrorists stopped the bus, boarded it, and demanded to know which girl was the infamous Malala, threatening to shoot all the girls on the bus if Malala did not identify herself. 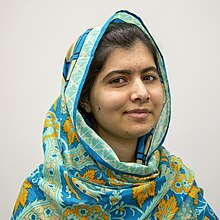 Malala displayed her signature courage by announcing that she was the Malala they were looking for, and the gunman shot her once in the face with an AK-47 assault rifle. The bullet entered near her eye and traveled through her neck, ending up in her shoulder. Malala was grievously wounded, but with international outrage on her side, she was taken to Britain for advanced medical care and made a full recovery. Undismayed by her near death experience, the now 21 year old is still advocating for women’s rights in Pakistan and around the world. She was awarded the 2014 Nobel Peace Prize. Kortemmeier, Todd. Greatest Female Athletes of All Time. Sportszone, 2017. Shen, Ann. Bad Girls Throughout History: 100 Remarkable Women Who Changed the World. Chronicle Books, 2016. Skeers, Linda. Women Who Dared: 52 Stories of Fearless Daredevils, Adventurers, and Rebels. Sourcebooks Jabberwocky , 2017. The featured image in this article, a photograph by Aldaron, a.k.a. Aldaron of a Boudica statue near Westminster Pier, London, is licensed under the Creative Commons Attribution-Share Alike 2.0 Generic license. Previous ArticleWhat Makes The Kentucky Derby Special?